While I mainly write about established artists on here I do like to focus on some less well-known emerging talent from time to time. One such artist I catch up with is singer-songwriter Josiah Mortimer playing a support slot in The Monarch in Camden for Southampton-based rising star, Seán McGowan. Mortimer is first on the bill tonight but pretty soon he has the audience on side with a good selection of songs which combine angry social commentary with sensitive and empathetic delivery and some nice acoustic guitar-playing. He’s a talented songwriter but throws in a couple of well-chosen covers, too. Clearly, this is a young man who has been on many, many demos and so the choice of ‘We Shall Overcome’ may not be a huge surprise but his gently defiant delivery gives it a freshness and a potency that makes it more than just another obvious staple from the protest anthem songbook. Another cover is far more of a surprise. I’ve long been familiar with the lefty, pro-environmental credentials of ‘Jerusalem’ ever since our school history teacher, Mr Holden, told us the back-story to it some time in the early 80s. Mortimer, too, is also well aware of the song’s provenance and, keen to “rescue it from the Tories”, he’s transformed Blake’s words from stirring, patriotic hymn to thoughtful, reflective ballad. The song that really gets the audience joining in loudly and enthusiastically tonight, though, is one of Mortimer’s own. Written just last month ‘Letter To America’ is a musical riposte to Donald Trump’s election victory. The sing-along chorus “build a wall, build a wall, around the White House” is a sentiment the audience don’t need much encouragement to sign up to. Mortimer tells me he’s been writing songs since he was 13 and that they “started getting pretty good” by the time he began performing in public at 16. He has recorded three EPs and successfully crowdfunded his first professional release Luddite Ballads in 2015. Beginning his musical career in Cornwall originally, he’s now based in London. Working full-time for a major national pressure group, heaps of political activism on top and a part-time journalism course to fit in as well, you may wonder how he finds the time to write, record and gig. But somehow he does and his Soundcloud page reveals an impressive selection of songs. If you want to hear some biting political commentary from an intelligent and eloquent singer-songwriter then Josiah Mortimer is well worth checking out. BBC Young Folk Award winners each year are given a slot at Fairport Convention’s Cropredy festival, and I really enjoyed this trio at Cropredy back in 2011, the year they won their award. But I must confess they’d completely fallen off my radar and it was only seeing a magazine article about them recently that I was prompted to check out their forthcoming schedule and discovered they were due to play Camden’s Cecil Sharp House. So here we are! Moore, Moss and Rutter are Tom Moore on violin, Archie Churchill Moss on melodeon and Jack Rutter on guitar and vocals. Although forming in 2009 it turns out the trio all continued to live in different parts of the country, and with university degrees to start and complete it as well as other musical collaborations it meant that gigging was sometimes sporadic rather than constant. But now they are on to their second album (the prog-ishly titled II) and we get to hear a number of songs and tunes from that tonight. In a varied set they deliver a few well-chosen traditional songs. But it’s perhaps the tunes where they really, really excel – with stunning interplay between violin, guitar and melodeon. Amazing sounds, of course, but seeing the interaction between the the three as they work a tune from one to the other really makes them worth seeing live. They do a nice version of the traditional tune Portsmouth – the one given an added burst of fame by Mike Oldfield in the 70s when he had a hit with it. And of the self-penned material, Moss’s tune-set Six Weeks/Early Thursday is a definite highlight. Having spent the past 15 years living in Brockley south-east London, perhaps the biggest surprise of the evening for me is when they announce that one of the next tunes they are going to play is called Lewisham Way, the long main road at the end of our road in SE4. It’s an esteemed street, steeped in creativity, with Goldsmiths College at one end and the music hall singer, Marie Lloyd, being one notable former resident. So it only seems right that it should get its very own folk tune. Written by Moore and coupled with a hornpipe by Henry Purcell it can be found here. The three go down really, really well tonight and their latest album is well worth a listen. I picked up a copy and Moore, Moss, Rutter are now firmly back on my radar. 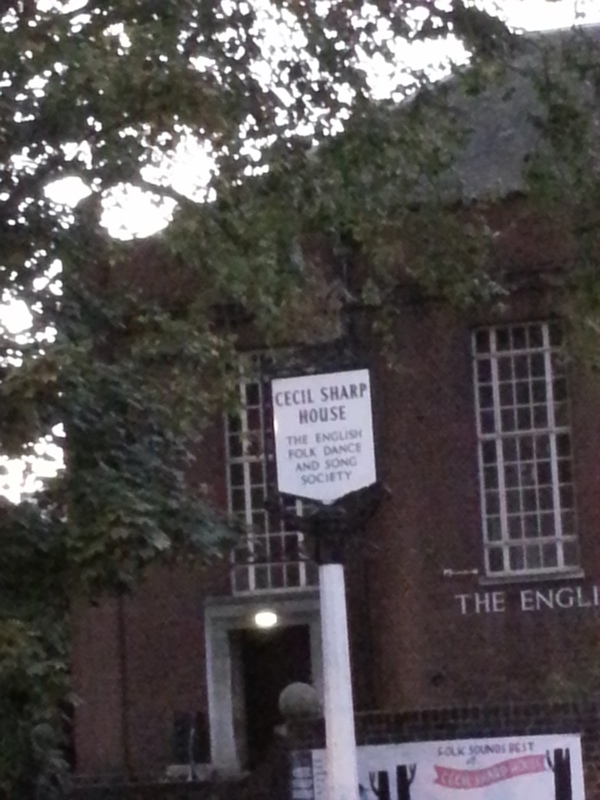 Cecil Sharp House’s 2015 programme of concerts continues to excel with a cracking performance from Mawkin. Formed in 2002 as a three-piece, Mawkn evolved into a five-piece band offering a rousing brand of folk-rock. The set is heavily dominated by material from their great new album The Ties That Bind, released in July. And they deliver us a nice mix of traditional English tunes and songs, some original compositions as well as the odd little nuggets from America and Sweden. Unlike some folk acts who feel compelled to unearth out ever more obscure traditional songs, Mawkin don’t shy away from performing some really well known traditional material, songs like Birds Upon a Tree, which they got everyone singing along to, and Searching for Lambs, both of which appear on their new album. 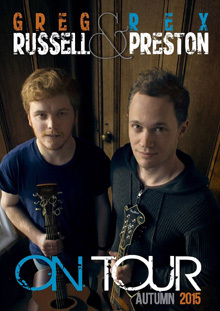 Vocals are shared between guitarist David Delarre, who takes the bulk of the singing duties, and his brother (and the band’s hugely talented fiddle-player) James. The latter I wouldn’t have minded hearing a little bit more of. 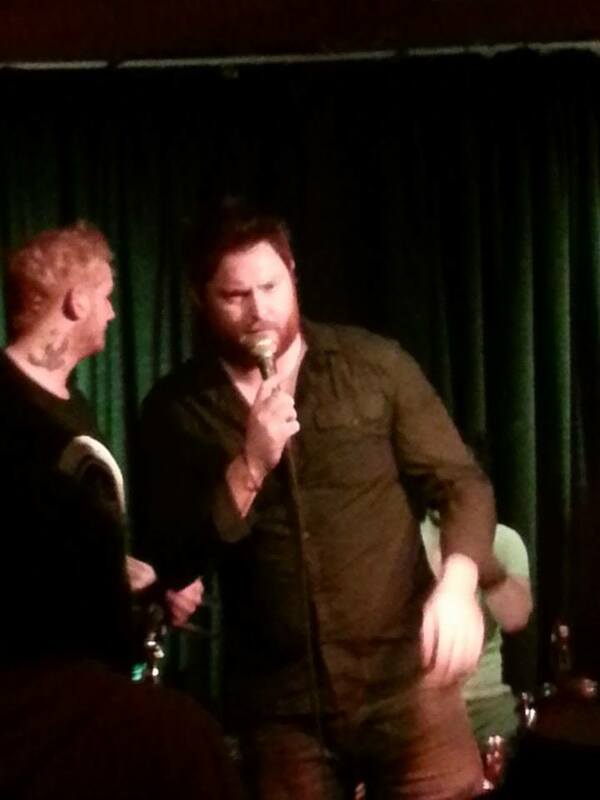 He has a really engaging vocal delivery – a sort of 90s indie meets English folk. The musicianship is superb, particularly the interplay on stage between fiddler, James Delarre, and melodeon player, Nick Cooke. 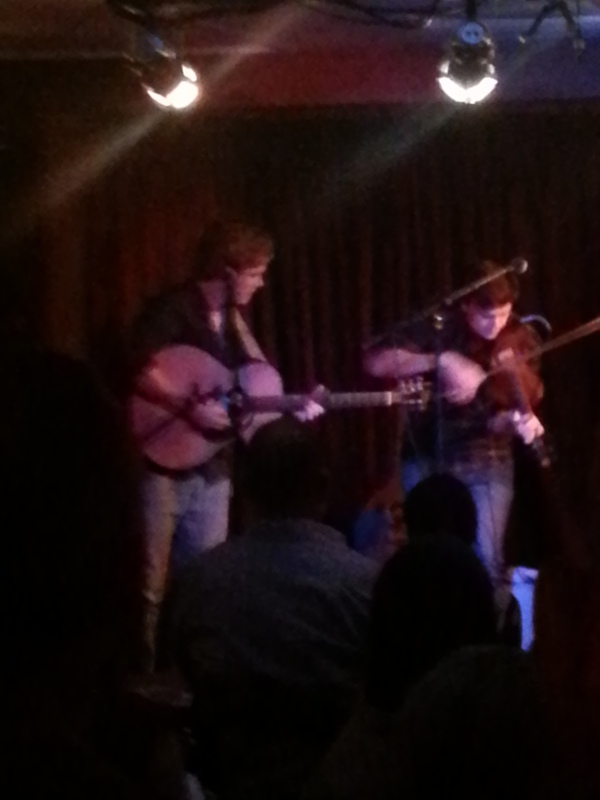 At one point, the rest of the band leave the stage while these two let rip on a couple of instrumentals. While many of the rockier contemporary folk acts have gone for the box-style cajun percussion rather than drums these days, Lee Richardson unashamedly plumps for the full drum kit. And not only does he use it to make some of the faster folk numbers really rock, he also creates some spookily atmospheric soundscapes with it. At times he reminded me of Martin Lamble’s playing on Fairport’s “A Sailors Life” – the track that started off the whole drums-on-English-folk-songs thing back in the late 60s. Mawkin have been making music for well over a decade now and while there probably weren’t more than thirty people here tonight, the noise the audience made in showing their appreciation was testimony to just how well this band was received. Deservedly so. In my professional life I once played a small part in the successful campaign to help save Camden Town’s Electric Ballroom from demolition. So ten years on, at a time when so many venues have closed, it feels good to be standing in this legendary place waiting for the even more legendary Glenn Hughes to take the stage. Tonight’s gig in Camden is the final night of a solo world tour that features Doug Aldrich on guitar and Pontus Engborg on drums. I’ve been a fan of Deep Purple virtually as long as I’ve been a fan of rock music. And although I’ve always loved the Gillan-fronted Mark 2 era albums I also love the output of Mark 3 era Deep Purple, too. And what made those albums particularly distinctive, had much to do with the influence of a certain Mr Glenn Hughes who brought his pitch-perfect harmony vocals and inventive funked-up bass playing to the party. But whereas, post-Deep Purple, the other Mark 2/Mark 3 members all found gainful employment in three of the biggest heavy rock bands of the time, namely Rainbow, Whitesnake and Gillan, Glenn Hughes seemed to be left to one side a little. Of course, he continued gigging and recording in various projects. But, arguably, it wasn’t until the arrival of Black Country Communion, a 21st century take on the old early-70s “super-group” concept, did he really have a project to match the significance of his Purple days. Like every supergroup before it, Black Country Communion eventually fell apart but was superceded by yet another supergroup, California Breed, one that also ended up going the same way. So Hughes is back touring as a solo artist and tells the audience tonight that’s absolutely the way he intends to keep it from now on. Few artists look as joyous to be on stage as Glenn Hughes or as appreciative of the audience. He genuinely looked like he was enjoying every single minute. After starting with a suitably heavy version of Stormbringer, the set tonight took us through songs from various stages of his long career. Deep Purple, of course, but also Trapeze, Hughes-Thrall and, more recently, Black Country Communion – as well as highlights from his solo career. Mistreated was a definite highlight of the evening for me and I suspect , judging by the reaction from the crowd, for much of the audience, too. And much as I’m exited at the thought of seeing the modern-day line-up of Deep Purple next month, I doubt we will see anything as majestic, soul-filled or dazzlingly, spine-tinglingly, emotionally brilliant as what we witnessed with Mistreated tonight. The latter-day Deep Purple have practically disowned the Mark 3 material and it doesn’t appear in any of the band’s setlists. 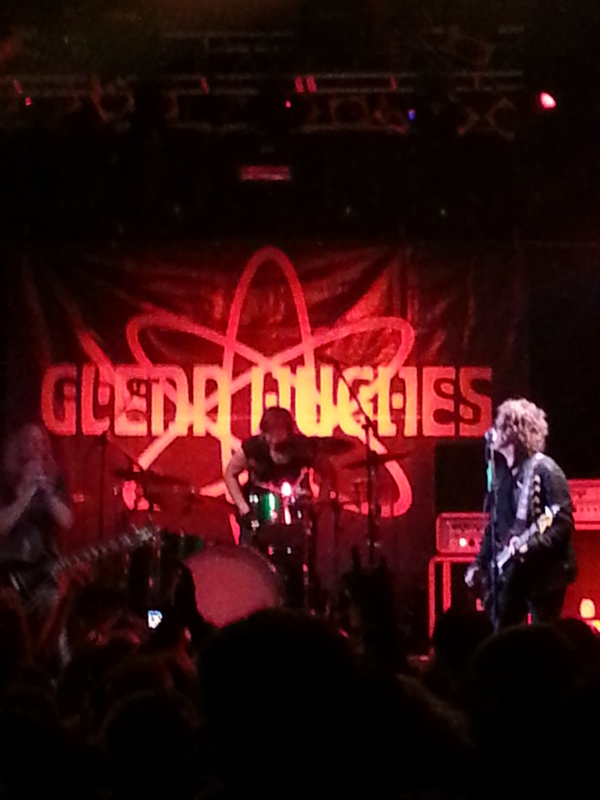 So let’s be thankful Glenn Hughes is helping to keep this music alive. And so magnificently he does it, too. Arguably, his voice is holding up better than either of the two front-men most associated with Deep Purple, Ian Gillan and David Coverdale. And he certainly hits all the high notes so beautifully. One final observation. I don’t think it was just my imagination but the crowd did seem slightly more ethnically diverse than at many similar rock gigs I’ve seen recently. Hughes’ funk-influenced bass-playing and soulful vocals always marked him out as someone who could reach out beyond the archetypal white male rock fan. And given how much he talks of the healing power of music I suspect that this would please Mr Hughes greatly. “Thanks for coming out and supporting this guy,” said guitarist, Doug Aldrich towards the end. “One of rock’s treasures.” Indeed he is. While I like to experience new acts, particularly new folk acts, I usually discover them as part of a festival line-up, or as support act to someone I do know or because I know one or more of the musicians from another project. It’s rare that I’ll go to a gig for someone I’m completely unfamiliar with, purely on spec. But the Sam Kelly Trio gig at Green Note in Camden caught my eye and here we are. 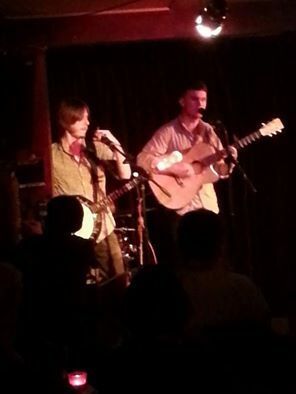 Singer and acoustic guitarist, Kelly, is joined by Jamie Francis on banjo and Evan Carson on drums/ bodhran. Although Kelly is clearly a talented singer song-writer, the trio set-up gives a real extra buzz to the performance. And although there’s a wide-range of material, from traditional English folk, to self-written, to country to traditional blues and more, the banjo gives the band a nice kind of Americana feel while at the same time remaining very, very English. And it gives the trio a clearly identifiable sound across the different types of material. Tonight is the EP launch for their five-track release, Spokes. And for an event like this what would make more sense than performing the whole thing from start to finish in full? So after an initial selection of songs, ranging from country to blues, Kelly announces that this is precisely what the band will do. Highlights include a brilliantly lively version of traditional sailor’s song On Board a 98, which tells of a young man press-ganged into a life on the sea. The Kelly-penned Healing Hands is much gentler but a really beautiful song in the set. After performing all but the last track on the EP they do a couple of instrumental numbers and a Dylan cover then, called back for an encore, Kelly takes the stage alone to perform the final track from the EP. This is The Unquiet Grave, just him, his lovely vocals and beautiful acoustic guitar. Tonight was a complete punt on a (to me) hitherto unknown act. But I’m glad I’ve become acquainted with the Sam Kelly Trio and I can see them going down a storm on the summer festival circuit. Like countless teen wannabes before them, guitarist Mickey Thin and his mate Daisy Lai formed a band at youth club. They were even lucky enough to get the chance to record an EP. Once inside the studio, Mickey and Daisy ,the band’s drummer, soon dumped their mates to join forces with the producer’s own band instead. Alternative metal band, Never A Hero was born. Six years on and tonight this five-piece from Suffolk are at The Black Heart in Camden Town on the final night of their current tour. It’s a Sunday night. The venue is hardly packed and, thankfully, numbers are boosted by members of the other two bands on the tour sticking around for the final set. But the energy of the gig is incredible and the enthusiasm of the crowd is so infectious, at times it gets hard to believe they are not actually performing to a much larger audience in a much bigger venue. The band (Phrixus – Lead Vocals, Mickey – Vocals/Guitars, Kaji – Lead Guitar, KB – Vocals/Bass and Daisy – Drums/Samples) bring together a range of musical influences. “Throw keyboards, heavy metal and pop into a tumble drier and this is what comes out,” claimed Thin recently. You get plenty of good, hard, aggressive, grungy guitar riffing, of course, but that’s combined with melodic vocals, catchy harmonised choruses and some real nice guitar solos. Now on to their second (just released) album they have a good selection of strong material available, like the excellent Nightboy which had everyone bouncing around and joining in the chorus. Kiss’s Gene Simmons recently pronounced that rock as an art form is dying. What he probably meant is that rock may not be churning out a succession of future multi-billionaires anymore. But who really cares about that? Bands like Never A Hero prove that rock is far from dead.